EN 61298-4 ed. 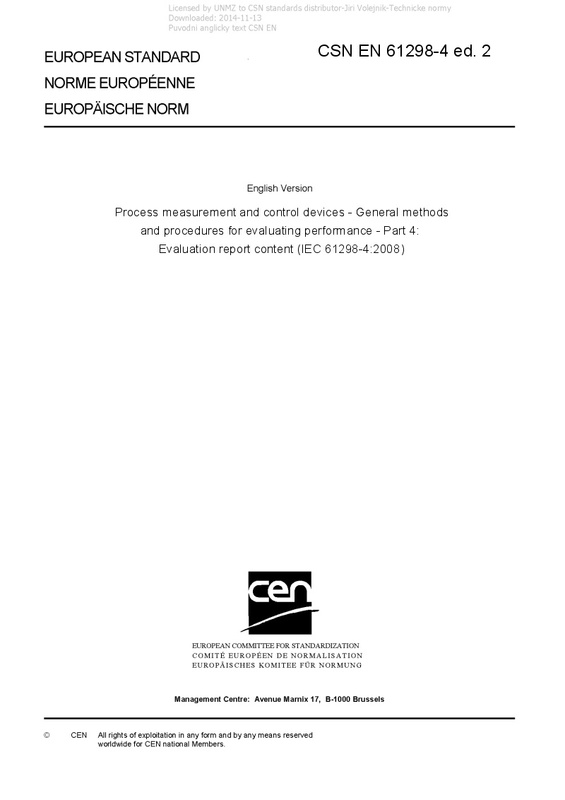 2 Process measurement and control devices - General methods and procedures for evaluating performance - Part 4: Evaluation report content (IEC 61298-4:2008) - IEC 61298-4:2008 specifies general methods and procedures for conducting tests, and reporting on the functional and performance characteristics of process measurement and control devices. The tests are applicable to any such devices characterized by their own specific input and output variables, and by the specific relationship (transfer function) between the inputs and outputs, and include analogue and digital devices. For devices that require special tests, this standard should be used, together with any product specific standard specifying special tests. It specifies the content of the written report on the evaluation or tests on a process measurement or control device, and the results obtained. It specifies the major items which should be included in the evaluation report.